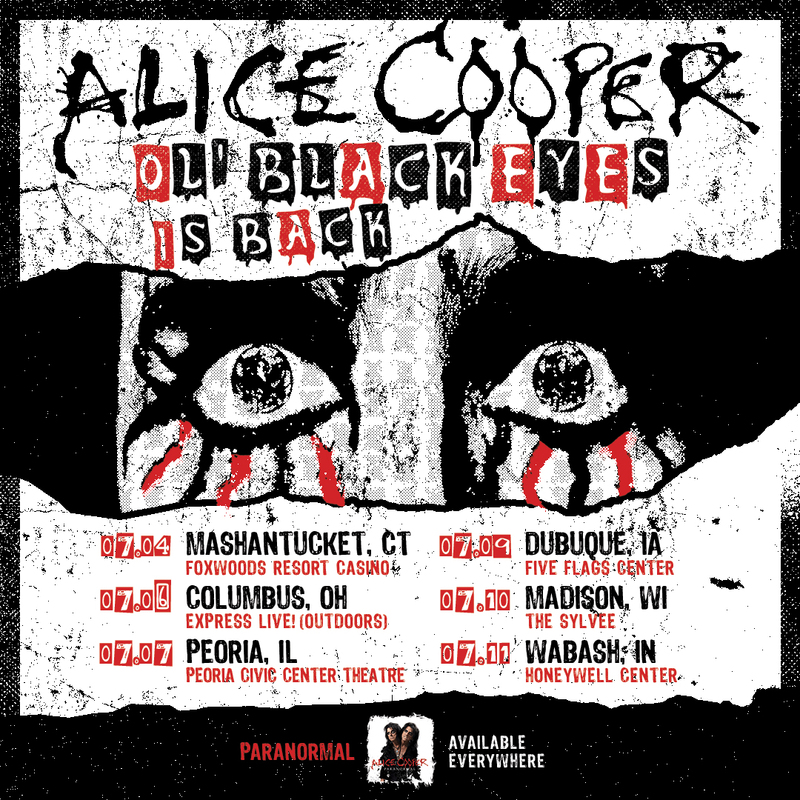 Rock ‘n’ Roll Hall of Famer Alice Cooper has announced a handful of July tour dates marking the premiere of his all-new “Ol’ Black Eyes Is Back” show, which will have a very different look than recent tours. These will precede his summer month-long co-headline run with Halestorm. The premiere of the tour will take place at Foxwoods on July 4th in Mashantucket, Connecticut and run through July 11 in Wabash, Indiana before joining forces with Halestorm on July 17 in Allentown, Pennsylvania. The VIP presale takes place on Tuesday, March 12 at 10 AM local time. The public onsale is Friday, March 15 at 10 AM local time. All Alice Cooper tour dates are below, including the previously announced shows with Halestorm, which is presented by Live Nation. New music from Alice is expected in time for the Summer 2019 tour, once again produced by Alice’s longtime collaborator Bob Ezrin, who most recently produced 2017’s acclaimed Paranormal album, featuring friends like ZZ Top’s Billy Gibbons, U2’s Larry Mullen Jr, and Deep Purple’s Roger Glover, as well as original Alice Cooper band members Neal Smith, Dennis Dunaway and Michael Bruce. Cooper’s most recent release, the live album A Paranormal Evening At The Olympia Paris, was released by earMUSIC in 2018. In addition to recording and touring both on his own and with The Hollywood Vampires (with pals Joe Perry and Johnny Depp, doing a recently announced short western USA tour in May), Alice continues his long-running nightly syndicated radio show “Nights With Alice Cooper,” heard worldwide on over 100 radio stations.